How Is Alcohol Poisoning Defined? Home / FAQ / What Is Alcohol Poisoning? Alcohol poisoning results from excessive intake of alcohol. Those suffering from alcohol abuse are prone to poisoning episodes, as large quantities of alcohol can impair many essential bodily functions. A normal human liver can detoxify only a single ounce of pure alcohol every 90 minutes, or one hour per drink according to the Mayo Clinic; alcohol intake beyond this level begins to cause harmful effects on the body. Large quantities of alcohol can be very dangerous when ingested over a short period of time. When the body attempts to manage intake of quantities of alcohol beyond what the liver can process, alcohol poisoning is likely to result. If you suspect a friend or family member's alcohol abuse is leading to alcohol poisoning, call 911. Seek medical assistance immediately if obvious poisoning symptoms occur, as these may be life-threatening. Binge drinking is the most common cause of alcohol poisoning. This can occur in social settings or when a drinker consumes five or more alcoholic beverages alone. Alcohol is readily available in the United States for anyone over the age of 21, and drinking at social events is very common. Alcohol poisoning can occur whenever a person consumes more alcohol than his body can handle, though the actual amounts required vary greatly between individuals. Poisoning is far more common in situations where large quantities of alcohol are available or drinking is a major part of social activities, such as sports events or parties. Obvious signs of alcohol poisoning include vomiting, seizures, slow breathing, and cold or clammy skin. Vomiting occurs as the body attempts to purge the alcohol from the system. Alcohol irritates the lining of the stomach, and the body tries to reject the substance when large quantities are present. Seizures can take many forms, some of which are deadly as they prevent normal breathing and bodily functions. Slow breathing, a rate of eight breaths per minute or less, can drastically impair respiratory functions and lead to severe damage due to lack of oxygen. The skin may take on a bluish hue similar to that of a drowning victim due to the same lack of oxygen in the blood flow. Call 911 for immediate medical assistance if you witness any of these signs, as they indicate a life-threatening situation. You can also fill out a quick contact form for more information on the signs and symptoms of alcohol poisoning. Excessive alcohol use impairs the body's systems and begins to damage the liver over time. Regular alcohol poisoning events may increase the damage to the liver and ultimately result in the failure of this vital organ. A lack of oxygen in the body, due to slow breathing or other respiratory conditions linked to alcohol poisoning, can cause brain damage and hamper normal bodily functions. This may cause damage to other internal organs or systems that may remain long after the poisoning incident and detoxification. Severe dehydration related to poisoning or vomiting can cause brain damage and other dangerous effects. The victim may also begin to experience hypoglycemia due to blood sugar variances, resulting in reoccurring seizures. Alcohol poisoning treatment typically requires hospitalization or emergency medical team responses. Treatments include the delivery of oxygen through a breathing device or nasal tube, attempting to limit vomiting events that may interfere with normal breathing and the use of medical chemicals to restore imbalances. These chemicals include sugar and saline solutions designed to combat hypoglycemia, thiamine to prevent permanent damage, and electrolytes that may have been lost to vomiting. In extreme cases, hemodialysis may be administered by doctors or emergency medical professionals. Hemodialysis is the use of external measures to cleanse alcohol from the blood and normally occurs only in carefully supervised hospital settings. 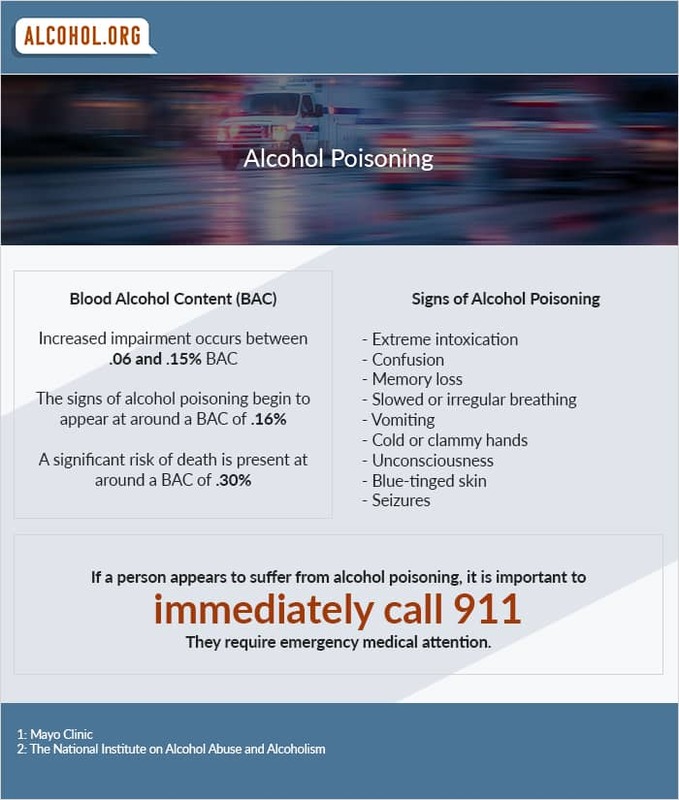 For more information on alcohol poisoning prevention, concerns and treatment options call us.